The 12th-seeded ’74-’75 Philadelphia Flyers won this series with great goaltending, a balanced offensive attack and physically beating up the 21st-seeded ’69-’70 St. Louis Blues. In the seven games, the Flyers totaled 118 PIM’s while having a player being ejected in three of the seven games. 12 different players scored a goal and 15 of the 17 skaters (forwards and defenseman) to play for the Flyers registered a point in the seven games. Bill Barber led them in goal scoring with four goals while there was a three-way tie for second with three goals between Reggie Leach, Rick MacLeish and surprisingly, Bob Kelly. Longtime captain and Mr. Philadelphia Flyer, Bobby Clarke, led them in assists with 10. Defensemen Tom Bladon and Andre Dupont were tied for second well behind Clarkie with four apiece. Clarke’s 10 points were also good enough for the team lead while Barber was second with seven. Not a single player finished this series with a negative plus/minus rating while Bladon’s +8 was a team-high. Barber, Clarke and Dupont all tied for second behind Bladon with +7 ratings. 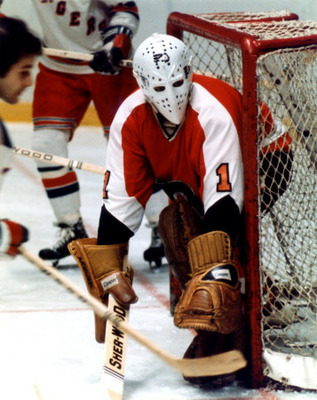 Goaltender Bernie Parent was his usual stellar self in net. He finished with a 4-1-2 record to go along with a 1.71 goals against average and a .938 save percentage. He capped off this series with a 25-save shutout performance in Game 7. The Blues’ offense was really slowed down in this series by Parent and the Flyers defense after a high-flying opening round. There was a four-way tie for the team lead in goal scoring at two between Red Berenson, Tim Ecclestone, Phil Goyette and Frank St. Marseille. Defenseman Barclay Plager, one of three Plager’s on this team, led St. Louis in assists with three while there was a handful of Blues that finished tied for second with two, including defenseman Jimmy Roberts and forwards Ab McDonald and Gary Sabourin. There was then an eighty-way tie for the team lead in overall scoring with three points. I’m not gonna list all of them, obviously, but it included many of the names already mentioned in this paragraph. Defensemen Bob Plager and Jean-Guy Tlabot were tied for the team-lead in plus/minus at even while Terry Crisp was second with a -1 rating. Much like the offense, legendary goaltender Jacques Plante was not as good as he was in the First Round. He posted a 3-4-0 record in the series with a 3.43 goals against average and a .908 save percentage. The ’74-’75 Flyers advance from the Second Round after last year’s representative lost so, this Flyers team is the first Flyers team to win a series in the UNP. For the ’69-’70 Blues, they match last year’s performance by advancing from the First Round only to lose in seven games in the Second Round. The ’74-’75 Flyers will now face the 28th-seeded ’09-’10 San Jose Sharks in the Third Round, who defeated the 5th-seeded ’14-’15 Chicago Blackhawks in the Second Round! Up next in the Second Round are the top-seeded ’78-’79 Montreal Canadiens and the 33rd-seeded ’06-’07 Nashville Predators! This entry was posted in 2nd Round, Ultimate NHL Playoff and tagged Ab McDonald, Andre Dupont, Barclay Plager, Bernie Parent, Bill Barber, Bill Clement, Bob Kelly, Bob Plager, Bobby Clarke, Don Saleski, Frank St. Marseille, Gary Sabourin, Jacques Plante, Jimmy Roberts, Phil Goyette, Red Berenson, Reggie Leach, Rick MacLeish, Second Round, Terry Crisp, Tim Ecclestone, Tom Bladon, Ultimate NHL Playoff. Bookmark the permalink.